Career and income LOOPHOLE discovered! Today, the path to more money, more career promotions, and more job freedom doesn’t require substantially more investment of time and money. 15-20 effective and proven key concepts. Your life is measured by steps and leaps. The steps take you from day to day, as you continue to learn and grow. But the leaps take you into a whole new realm of significance. You are ultimately defined by the leaps you take. From a respectable salary to one with an extra zero on the end. From one middle management title to a title where an entire company now looks up to you. From working for your boss to starting the business of your dreams. Unfortunately, these great leaps in life are typically few and far between. And they usually take place only after years (or decades) of great effort. Discover the loophole that helps you make the leap from earning a living… to making a FORTUNE! Take two people who have never played golf. Give one of them every book, video and resource about playing golf. He has all weekend to LEARN… but he can’t swing a club or step foot on the greens. Then, give the second person ONLY the essential instruction that will allow her to excel at golf — omitting the hundreds of tips and techniques that will only clutter the mind, but provide little result. Then give her the weekend to put everything she learns into ACTION on a golf course. At the end of the weekend, there’s no doubt the woman would be the much better golfer. Because she focused on the MOST EFFECTIVE instruction, and then she directly APPLIED it. You just need to master 15-20 key concepts that provide the most value in each major area of business — and start applying them to your business or in your company. These concepts are highly practical, immediately applicable, and incredibly effective. Enjoy greater fulfillment over the course of your working life -- and more! I’ve helped millions of people worldwide substantially improve their careers, businesses, incomes, and quality of life. And that's just for starters. I've helped millions of people — corporate leaders, entrepreneurs, and smart, ambitious people like you — learn essential business concepts on their own terms that enabled them to immediately impact their careers and leap to a far greater income and a greater sense of accomplishment. But 10 years ago, I was on the other side of that equation. Try it for 30 days for just $1.00! Can you SEE YOURSELF in this story? On the other hand was the time involved, and, most importantly, the overwhelming amount of money I'd have to spend. Money it would take me years and years to repay. I took his advice a step further. I realized I was in a unique position to help people learn these essential skills. So I decided to devote my life to teaching them. I'm the only person in the world who teaches this material. … we will give you your money back! you'll gain at least $250,000 in REAL-WORLD RETURN on your investment by applying the principles and tactics you've learned, simply return it any time within ONE YEAR for a full, no-questions-asked refund. Even though you're paying just a tiny fraction of the $2,500 they pay, I'm still guaranteeing you the same ROI I guarantee them. That's how confident I am in what The Personal MBA Masterclass is going to do for you. 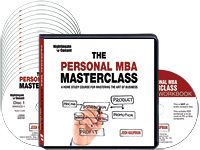 The Personal MBA Masterclass is something that — if you take it seriously and commit to the outcome — is virtually guaranteed to quickly and permanently improve your career, your finances, and your entire life. P.S. A word of warning: The Personal MBA Masterclass isn't for everyone. But if you're serious about mastering business, motivated to apply what you learn, and willing to go out into the world and create massive amounts of value... and increase your wealth and happiness in the process… it IS for YOU. And you'll be amazed by how quickly you start to see real results. Order it today and find out for yourself — 100% RISK-FREE! YES, I want master the few essential skills and knowledge that will bring me more money, more opportunity, and more fulfillment in my career. 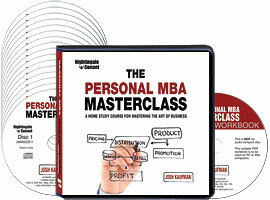 Please send me Josh Kaufman's 16-CD program The Personal MBA Masterclass: A Home Study Course for Mastering the Art of Business, plus the PDF workbook, to try for 30 days for JUST $1.00. If I don't see how the principles and tactics in this program can significantly improve my career prospects and wealth potential, I'll simply return it and owe nothing more. No questions asked. Otherwise I'll keep it for three easy payments of just $49.65 — which is $50 off the full program price — starting at the end of my 30-day trial.